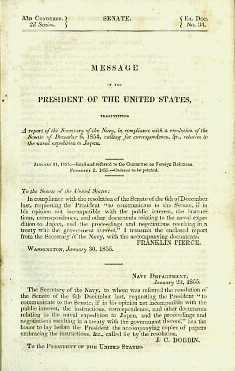 In 1853 an American Squadron under the command of Commodore M.C.Perry, arrived at Edo Bay (Tokyo), demanding that Japan open its borders to foreign commerce. An Expedition Of An American Squadron to the China Seas and Japan. The monumental voyage lasted from 1852 to 1854. Published by Order of Congress of United States, issued in Washington in 1856. Most important selection of views from this voyage, being the first available for over 200 years.